If you are here, it is likely that you have been blessed with heavy clay soils! These dense, compact soil types present some unique challenges when it comes to creating a solid, healthy foundation for your garden design. One of these unique challenges is ensuring that the site has good landscape drainage. Nature usually presents us with mixed blessings, and heavy clay soil is one of those! Clay soils are among the most nutrient rich soils that there are, but those nutrients are often locked in an iron grip! Coaxing heavy clay soils to give up those nutrients so that they can be devoured by your plants can be a demanding process. Not only are these soils reluctant to share their nutrients with your prized plantings, they also are the most water retentive soils found in nature. This is great for plants, as long as there is enough sand, silt and humus in the soil mix to mitigate the selfish nature of those clay soil particles, but often our soils have such heavy clay content that plants are drowned by the water retained by those soils. Soils are composed of three major types of matter. Sand, the first of these, has large particles, usually rough shaped, which do not absorb water well. Silt, the second type of soil matter, has medium sized particles which absorb water, but do not retain it for long periods of time. 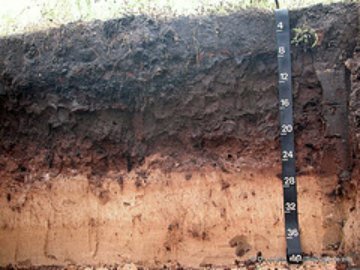 Heavy clay soils are made up of very fine particles which are so densely packed that they will form tight, impenetrable layers that may not allow adequate drainage. 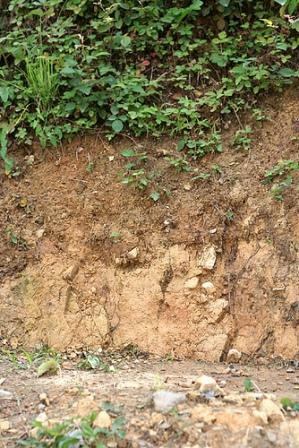 These heavy clay soils may become so waterlogged that they will not retain adequate air supply for plants. Heavy clay soils will hold on to water for a very long time, therefore, these soils are the most prone to leaving your garden plagued with standing water. 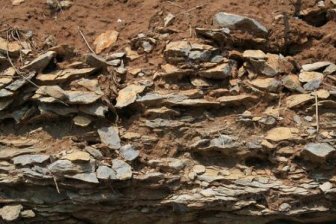 When these same soils dry out, they can create such a hard, dense surface that it is nearly impossible to break them up without extreme, sustained effort. This makes it hard for water to actually penetrate into the soil, thus leaving your plants vulnerable to not receiving water easily! Clay can create a crust which can starve plants for water. With enough water, this crust layer will break down, but that much water can also starve your plants for air! rock content, they can be nearly impenetrable without a pick ax or crowbar. Even with these tools, it can be very slow going. Add to this the fact that many building contractors will use heavy machinery during the building of homes in today’s world. These heavy machines compact soils, and break down soil structure, which can destroy air pockets that allow drainage and allow plants to breathe. Builders may do no more than dump a layer of topsoil on top of this layer, which creates a further issue in that the compacted subsurface soil now becomes a barrier and can cause additional landscape drainage issues in the form of water runoff. There are several solutions to landscape drainage issues which may be used when encountering heavy clay soils which cause these issues. With patience, and a solid soil management plan, these same soils can become the perfect hosts to your new garden design. Try some of the solutions presented here to deal with drainage issues created by heavy clay soils. can have a dramatic effect over time on soil structure. In some cases, where heavy clay soil has some sand, silt and organic matter content, it is sufficient to layer 3-4 inches of organic matter, such as peat, compost, or manure, on the surface, and let nature take its course. The work of natures' little soil manufacturer, the earthworm, will over time begin to improve the overall soil quality in these situations. By far the more common situation however, is where the soil in an area is entirely natural clay, with little sand, silt, or organic matter content. In these situations, it is not sufficient to add organic matter to the surface and walk away. These situations require both hard work and patience. It may take many years to truly improve the composition of clay soils. The best way to handle improvement of clay soil is to begin amending soil by actually digging organic matter into the top 6 to 8 inches of soil, thus breaking up the heavy clay layers and providing air space in the soil to allow plants to breathe and water to drain. However, doing this once and walking away is rarely enough. 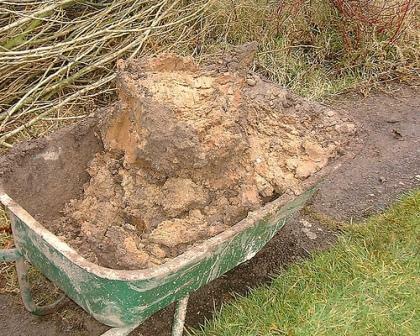 This process must be repeated regularly in any garden spaces to build up soil structure over time. Heavy clay soil has so much clay content that it may overwhelm other soil types and break them down. Only repeated applications of organic matter will eventually resolve this issue. A common misconception needs to be cleared up here. One often employed practice when gardeners attempt to amend their heavy clay soils is to add sand content. This is exactly the opposite of what your garden needs to improve drainage and increase nutrient release. Think about it! Many cultures use a mix of sand and clay to build their homes! Clay, sand and straw have been used for thousands of years to make brick! Sand fills up the few air pockets that are present in clay soils, and the clay binds the sand, and you are left with cement! Not great for drainage! In order for sand to correct the structure of heavy clay, it must be applied in such quantities that it makes up nearly 50% of the final soil content. Unless you live on the beach and have heavy clay soil (not highly likely!) this option is not truly a practical solution. When soil amendments are not sufficient to manage your landscape drainage issues, or if you need an immediate solution, pursue some of the following ideas to help resolve your drainage problem. holding capacity or will drain into a water collection system. These are perfect solutions near hardscape areas. Area drains can also be used in the garden areas, or in patio and deck areas to drain off water and deposit it in alternative locations where water can drain properly. Below is a video from Sprinkler Daddy that does a great job of explaining how to go about installing an area drain. Area drains are usually not sufficient to handle large and steady deluges of water, but are excellent for the occasional drenchings often visited upon us by Mother Nature. overlays another layer of soil that drains more easily. It is usually a yard wide and long, and a yard deep. It may be open, or filled with river rock or small stone and covered with soil. These larger versions of soakaways are often best installed away from the house in a garden space that may be covered over with plantings or otherwise hidden. However, be aware that a soakaway may last only a few years, as even the best constructed soakaway is vulnerable to silt and organic matter filling up the space between stones, at which point the soakaway may fail. There are commericial versions of a soakaway called catch basins that are smaller and can be used in low spots of a garden or near downspouts, to catch heavy rain water runoff. that drains all along its length. This is a great solution for areas where water deluges occur after a heavy rainfall, such as at the base of a steep slope or driveway that slopes down toward the house. Channel drains can become an excellent design addition as well. Using these drains in clever ways in the garden can provide interesting lines that play well against other elements of the garden.